Lynda Kiejko qualified as one of two shooters representing Canada in next month’s Summer Olympic Games in Rio de Janeiro. 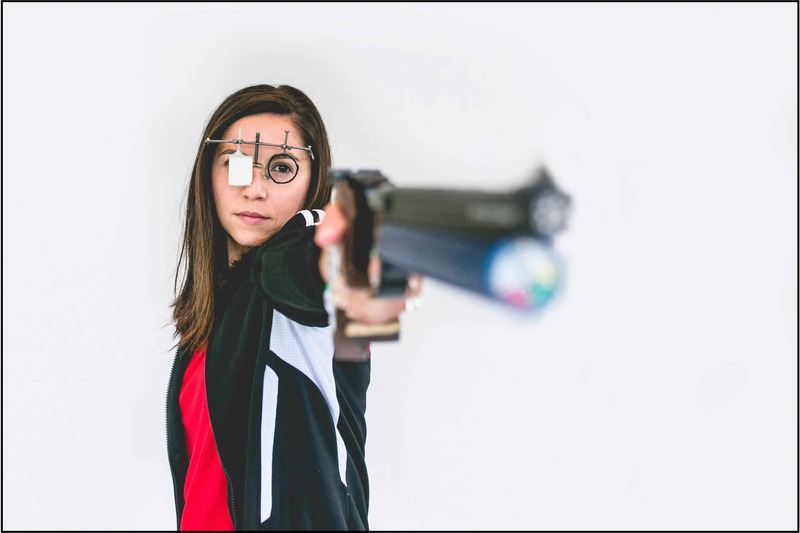 The 35-year-old resident of Calgary will compete in the women’s 25-metre pistol and 10-metre air pistol. Kiejko began shooting at the age of 11 after her father, a three-time Olympic shooter, now deceased, set up an air-pistol range in the basement of their home. Her home range today is the Calgary Rifle & Pistol Club. Her older sister, Dorothy, is also an Olympic shooter. The following are excerpts from a Skype interview with Kiejko on July 14. Click here for the full transcript as a PDF. For more information, visit Kiejko’s website at CanadianShootingStars.com, or her page on the Canadian Olympic Team’s website. Q: What excites you the most about Rio? Once I fire that first shot, I’m officially an Olympian. After that, I just get to shoot. I get to do what I love to do. This is such an incredible opportunity that I get to do it on such a great world stage. Q: What is your training schedule? I work out five days a week. I’m training now five to six days a week as well. My goal right now is between 2 and 3 hours, sometimes 4 hours, at the range every day. Q: What do you focus on differently today vs. 15 years ago, when you were already a high-level competitor? What has changed? Fifteen years ago I was really wrapped up in defining me as an athlete. I was a lot more tied to my successes or my lack thereof. It was a much stronger emotional tie between my performances and specifically the outcomes. Now we’re focused more on the inputs: What can I do? What’s the process I go about? Can I evaluate my success based on how I execute versus what the outcome is? Because sometimes, you’ve got good shots, and sometimes they’re not quite as good as you want. The outcome now becomes the cherry on the cake rather than the cake. When I think about my performance at the 2003 Pan American Games, I got a bronze medal. People were so excited. That was the best I had ever done. I walked off the line and I bawled. I cried terribly hard, because I had missed the Athens Olympics by 0.7 of a point. It was so crushing, and I didn’t have the performance that I was hoping to have. I was really tied to the outcome. Q: How do you manage the wobble, when your sights are on target and the gun seems to wobble? If there’s a wobble I put it down. I try not to shoot when there is a wobble. You’re always going to move, but it’s always working with the movement to see where it is, and recognizing the shot when it’s good, and if it’s not good, putting it down and starting again. A big piece of that is focusing on the process. When you execute all the different steps of the process, the shot breaks and it’s exactly what you want it to be. Q: Have you always been a top shot? When I started, I was a terrible shooter. When I started, there was nothing “natural ability” about me, nothing at all. The only thing I’ve really got going for me is my blind determination. When I’m committed to doing something, I’m going all in. Q: What is it like to attend matches with your family? My husband has travelled with me, and actually my daughter has travelled with me too. We’ve taken our toddler all over the world. I went to the Commonwealth Games 15 days after I gave birth. They’re calling us to the line to compete, and I was sitting in the stands, nursing. I was like, “Uh, I’ll be right there, just give me a second.” No big deal. My husband is incredible. It’s a partnership. There’s no bigger support of me than probably my husband. Q: How do you pay for training and matches? This year, as a “carded” athlete, you get funding from Sport Canada, but that covers only a small portion of your costs. I am fortunate, I’m a carded athlete this year. It’s been incredible. I’ve stepped up my training, the amount of competitions I’ve gone to, the ammunition I have definitely stepped up. I’m using much higher quality ammunition than I was previously. Those all have costs associated with them. It all adds up. I’ve been completely floored by the response to my MakeAChamp campaign. That’s the first time I’ve ever used a platform like that. I absolutely hate asking people for money. It’s just really tough. Q: What is it like to be a shooter in the context of Canadian laws, and the murders in Orlando and Dallas? I’m a law-abiding citizen. I lock everything up, I put everything away. It can unfortunately be used in the wrong ways, but usually the people who are using it in negative ways aren’t the law-abiding citizens. Those aren’t the people who are following the rules. If someone has the intent to do something dangerous, having a rule in place isn’t really going to stop them. It’s hard for me to say what the solution is, but it is tough when we have laws that make it harder for us to enjoy the sport that we love, and to introduce new people to it.